Cook spinach with 2 tbsp of water in the microwave or on the stovetop for 5 minutes or until just wilted. Let cool and drain excess water. Place tofu in food processor and pulse until it is pureed. Add the ricotta cheese, pulse until combined, then add spinach and grated cheese and process until smooth, about 30 seconds. Season with salt and pepper. Line baking sheet with parchment paper, or spray sheet with non-stick cooking spray. Take a wrap and place approximately 2 tbsp of mixture in the center if each wrap. Do not place filling near the edge. Use a pastry brush dipped in water and brush edges of wrap. Place a second wrap on top, then crimp edges together tightly with your fingers or the tines of a fork. Brush ravioli lightly with olive oil. Bake in 375° F oven for 10-12 minutes or until lightly browned. 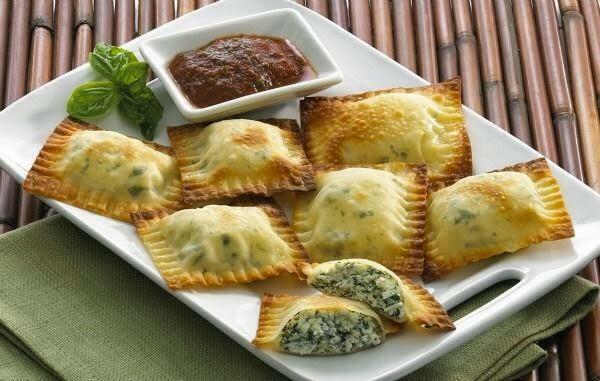 Serve ravioli with your favorite marinara sauce for dipping.